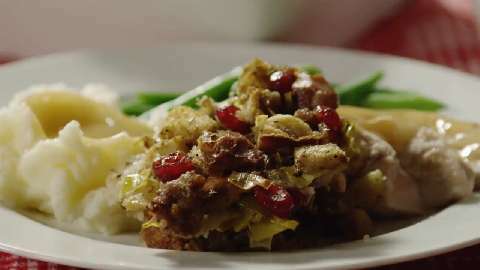 This Sage Cranberry Dressing is a bit unusual as stuffing recipes go, but it is a favorite side dish at the restaurant and at home. If you use this dressing recipe to stuff poultry instead of baking the dressing separately, fill the bird loosely. Do not pack, as the stuffing expands during cooking. I love to serve this dressing with roast pork loin or lemon roasted chicken or roast turkey. For this recipe, all the ingredients that require cooking must be completely cooked before combining with the other dressing ingredients as they will cook very little during the remaining baking or roasting process. Cool all the ingredients before combining to avoid bacteria growth potentials. Never allow baked or unbaked dressing to stay in the “Food Danger Zone” (40 to 140 degrees F) longer than one hour. Refrigerate unbaked dressing if you are not going to bake it immediately. Hold baked dressing above 140 degrees F for serving or chill uncovered as rapidly as possible. Reheat baked dressing rapidly to an internal temperature of 180 degrees F.
Preparation time: 12-14 minutes. Serves 8-10 (Makes enough to loosely stuff a 20 pound turkey). 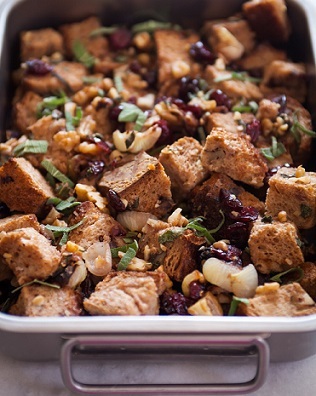 Enjoy your restaurant stuffing recipe and the company of those you share it with! 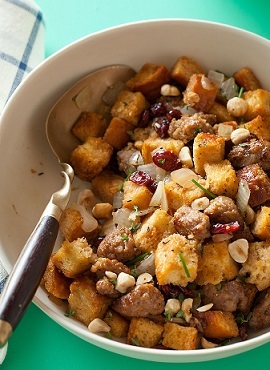 "Stuffing is my favorite food in the world! 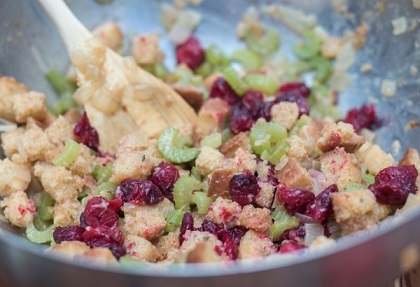 I have been known to make stuffing in the middle of summer."